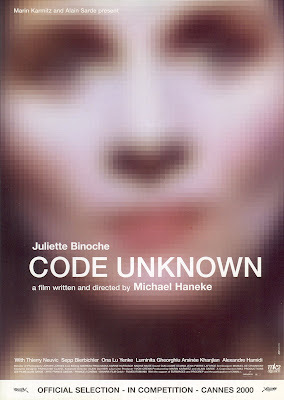 So, I don't usually do posts like this, but I was researching a movie today that I'm supposed to be writing on soon for Film For The Soul's Counting Down The Zeroes Project and ran across this poster for Code Unknown, which made me think of another poster and movie with [perhaps] similar ideas behind it, at least from the reviews I've read. Anyone else weirded out by this? Or am I stretching for the sake of stretching? You could probably throw in some of the posters for Blindness. I really love both these posters...I think the design for TGE is one of the most memorable I have seen in awhile. They are both pixellated, but the Soderbergh poster reminds me more of a Lichtenstein painting than it does of the poster above it. Save the close-ups, I don't think they're too terribly similar. 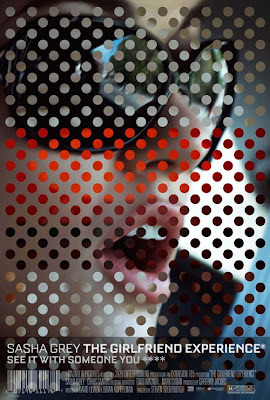 Can anyone tell what the other image is of in the The Girlfriend Experience poster? (The one that isn't a girl's face.) I still can't make it out. I just think its interesting that two movies very much about realism and performance have posters of blurred female actresses who are playing actresses/sort of themselves in both movies. No? I think "performance" is a pretty minor theme of Code Unknown though. It fits somewhere under the umbrella(s) of other bigger issues in the film. A Heart of Gold? Only If It’s 24 Karat.